Onions can be found in most households, with nearly 70% of consumers purchasing them in the past year, according Fresh Trends 2016. That means that you don’t have to work too hard to get them moving off your shelves. Use onions’ popularity to boost sales of other items in your produce department. Onions can improve health because they contain a variety of important vitamins and minerals. Onions contain quercetin, an antioxidant that has been shown to protect people from cataracts, heart disease and cancer. They also may help prevent bone-density loss and help prevent osteoporosis. Vitamin C is found in onions. Vitamin C has been shown to help prevent cancer and boost the immune system. Research shows that eating onions may provide some anti-inflammatory benefits. 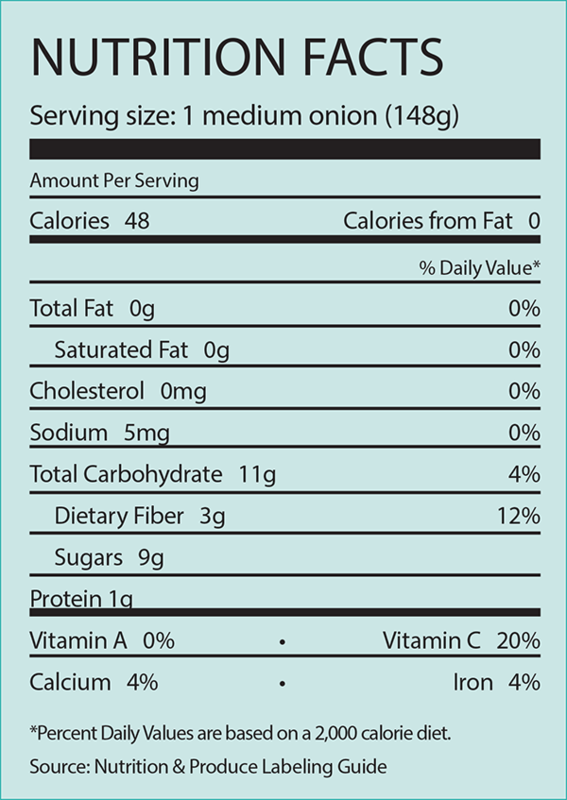 The U.S. Food and Drug Administration has approved the following nutrient content descriptors for bulb onions: fat-free, saturated fat-free, sodium-free (must state that bulb onions contain less than 5 mg sodium per 85 g bulb onion), cholesterol-free, low in calories, and a good source of vitamin C.
After increasing nearly 5% in 2016, bulb onion sales dropped slightly in 2017. Sales fell 2%, but volume increased 2.1%. Per-pound retail price dropped more than 3%. Onions are used in a multitude of ways, so cross-merchandise them with everything from meat to salad, including hamburgers and steaks, green peppers, soup supplies, stir-fry vegetables and bagged salads. Onions are available year-round, so promote them seasonally. Fall: Include onions in football game-day promotions as a topping for burgers grilled at tailgate parties. Winter: Add onions to soup displays as they add flavor and texture to any soup. Promote onions during the winter holidays as an addition to stuffing for the holiday meal. Include onions in Chinese New Year displays as they can add flavor to stir-fries. Spring: Onions can liven up any salad, so promote them as an addition to bagged salads. Summer: Onions shine as a topping for grilled meats during the summer. Create a secondary display in the meat department so consumers are inspired to add them to their grilled creations. Include multiple types of onions in your displays. Red, white and yellow onions make a great color contrast and will attract consumers no matter what their onion needs are. Onions must be kept dry and at room temperature. Wet onions will spoil quickly, so keep them away from misters and refrigeration. Create plenty of space for your onion display. Red onions provide an attractive color break between white and yellow varieties. Onion skins can create a messy display, so keep an eye on your display and remove any loose skins from the display. Include sliced and diced fresh-cut onions on your display to appeal to those who don’t want to go through the trouble of cutting them at home. Create waterfall displays that bring product into the aisle to get onions in front of the consumer. Onions can be served in a variety of ways from steamed or baked to grilled or roasted. Their versatility means they can be added to almost any dish. Prepare onions right before you add them to a dish to keep the flavor fresh. Refrigerate onions for 30 minutes before cutting to cut down on the tears. Run onions under warm water to loosen the peel. Sweeten up your raw onions by slicing them and placing them in the refrigerator for an hour before serving. Add onions as a topping for sandwiches and burgers. Include onions on salad bars and in salads. Create a flavorful breakfast dish by adding onions to eggs or omelets. Temperature: 40 to 60 F (4.4 to 15.6 C) Relative humidity: 65-70% Mist: no Typical shelf life: 30 to 180 days Odor producer (Do not store or transport odor-sensitive items with commodities that produce odors. Onions produce odors that will be absorbed by apples, celery and pears.) Odor-sensitive (Onions will absorb odors produced by apples and pears.) Moderately sensitive to freezing injury (Able to recover from one or two light freezings.) For the short time onions are held at retail, they are usually not refrigerated. They need a dry atmosphere and too much humidity induces decay. Onions draw moisture from vegetables they are stored with, which may also cause decay. Stack onions to provide good air circulation. If in bags, stack in a crisscross manner leaving air space across the middle. Cartons should be stacked. 71% of consumers said they purchased onions in the past year. Consumers making $25,000-49,999 per year are the most likely economic demographic to purchase onions. Women were 17 percentage points more likely to purchase onions than men.